Perfect location for your family on Whitefish Mountain! Located steps away from the village, enjoy many recreational activities in all seasons. This unit is steps away from the ski runs and you can ski home to a warm fire . No need to drive to town when the free shuttle is available at the Village. The three bedrooms: Kingbed, Queenbed, and Twin bunk beds. A front deck that views the mountain and a back porch for the kids to play....Summer, Spring, Fall and Winter fun for everyone. In the heart of Whitefish Mountain Lodge enjoy activities regardless of the season. Festivals year round and a short day-drive to Glacier National Park. 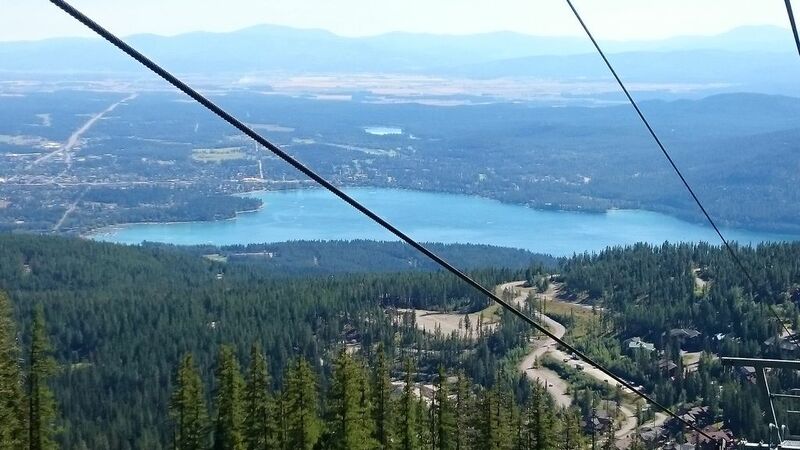 Summer activities include alpine slide, gondola to the top of the mountain and hiking and biking around the mountain. Lake Beach and downtown shopping is 10 minutes away! Getaway from it all and Hideaway on Winter Lane! My husband and I are managing our families' condo and are to excited share it with you. We currently live in Seeley Lake, Montana and enjoy coming up to Whitefish often. We love to spend time with our family skiing, hiking, fishing and relaxing. We have been able to create some beautiful memories and hope you do as well. The location is spectacular! The view is amazing as well and the amenities of things to do are endless. We love to hideaway from our everyday responsibilities when we come here. half bath on main level, both fulls on second level. Beautiful picturesque view from the front deck of Whitefish Mountain. 1 in Master and 1 in Living Room with cable. 1 in Queen Bedroom with Smart DVD player, no cable. Stay 100% dry in the Garage and dry out area for your skis and boots before walking into the cozy mountain retreat. Snug ski in condo for two couples! Views of the slopes, ski to the back door (blue square level terrain) short walk up hill to get to the slopes. Kitchen met all needs, showers were hot, and room heating worked well. Short walk down to the town S.N.O.W. bus stop. This property and this mountain are seriously the most bang for your buck for an awesome ski vacation. Gorgeous Mountain View’s, roomy condo was perfect for our needs. I hope to return to this property periodically in the future. Great location. Beautiful view. Prime location. Ski drying room a plus. We really enjoyed our stay. The condo is very close to chair 3. Roads were a tad icy, so we opted not to ski in from the Park ski trail. Technically you can ski to the Park trail and down to chair 3 and get going. Home is older but they did a good job decorating and has a “warm cozy” feeling. Brought our dogs. There really isn’t a good place to take them except for the awesome Whitefish dog park. (Not condo related, just a side note). So we had to drive into town for that but other than that, we literally could’ve stayed on the mountain the entire trip because everything is readily available for your day. We headed into Costco to load up on snacks & meals for the week. This condo offers full kitchen access, so it was nice not having to go out to eat if we opted to stay in. Warm cozy fire place was a plus. Owners were very open to communicating and helped with any questions we had. Neighbor was very nice and friendly. Our stay was quiet and very pleasant. One of the best features was the “drying room.” So nice having to just load our ski gear into that room after a long day & have them warm and dry for the next day’s playtime on the mountain. Garage is a tad small but our Subaru fit perfectly. There was also room for our Suburban right outside the garage door. Thanks for the great stay. Condo was excellent location to ski lifts. We were able to ski straight to garage. Loved the heated drying room in garage for all our stuff- nice to have warm boots to put on in the morning. Condo was spacious and had everything we needed- condiments ect. Would highly recommend. Loved the view and the fireplace was nice and cozy in the evening after a long day of skiing. We would be back! Extremely convenient location for a weekend ski trip. You’re just a few steps away from a chair that you can use to get to the main chairlifts. Also, very close to Hellroaring Chalet and Bierstube. Plenty of space. Kitchen is kind of dated, but didn’t bother us. Thank you for a great review! We have a few projects on our list so hopefully on your next return you can enjoy the improvements. Perfect location and very well done. We hope to return year after year. Welcome back anytime Brian! Glad you enjoyed your trip to Whitefish! Come visit again! In the heart of Whitefish Mountain Lodge enjoy activities regardless of the season. Festivals year round and a short day-drive to Glacier National Park. Getaway from it all and Hideaway on Winter Lane! Pets are welcome but we cannot have a barking dog while you are enjoying the mountain. Security will be notified and you will be asked to remove your pet. A 24/7 phone number will be required. Dog hotels can be provided upon request.